Form No. 4.-100 - 17.8.10. Delivery Date 15 APR 1912. No. OLYMPIC, Handed in at CARPATHIA. To : CAPTAIN HADDOCK OLYMPIC RECVD AT 5.37 pm EST. CAPTAIN CHIEF 1st AND SIXTH OFFICERS AND ALL ENGINEERS GONE ALSO DOCTOR ALL PURSERS ONE MARCONI OPERATOR AND CHIEF STEWARD. 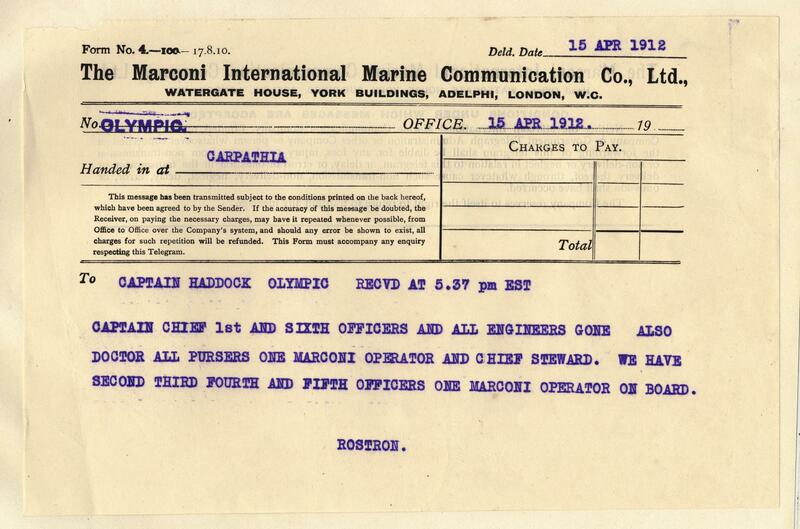 WE HAVE SECOND THIRD FOURTH AND FIFTH OFFICERS ONE MARCONI OPERATOR ON BOARD. ROSTRON.